The source of the Niger River is in the Guinea Highlands, in the southeastern region of Guinea. Though there was initial confusion on the source, current evidence of the source of Niger River is documented as the Guinea Ranges. The Niger River is located on the western part of the continent of Africa. Ranked the third longest river in Africa at 2,597 miles, Niger has its source in the Guinea Mountains in South Eastern part of present-day Guinea country. The River flows across five countries namely Guinea, Mali, Niger, Benin, and Nigeria before emptying into the Atlantic Ocean. Across these countries, the River is called by different names such as Jeliba, Orimiri, Isa Ber, Egerew, and Kwara all interpreted to mean the massive river. Ancient explorers had a difficult time finding the source of Niger River due to the inability to differentiate between the Niger River from Nile and Senegal Rivers. Many thought that the three rivers were the same. In 1788, the British formed an association whose task was to explore Africa and of importance the source of the Niger River and other African rivers. The expedition took a while until 1796 when a Scottish named Mungo Park discovered part of the river. However, it was not until October 1946 when French explorers made a journey along the Niger River and were able to document the source and the course. Their journey ended in March 1947 at the point where the river joins the Atlantic Ocean. Helge Hjelland of Norway also went up the river to the source at the Guinea Highlands then along the river to the mouth. Though there was initial confusion on the source, current evidence of the source of Niger River is documented as the Guinea Ranges. The exact point where the river originates is in the highlands near the Sierra Leone boundary at 2,500 feet (750 meters) above the sea level. The source is only 200 miles (320 kilometers) north of the Atlantic Ocean. The highlands extend to three more countries namely Sierra Leone, Liberia, and Ivory Coast. Other than the Niger River, the highlands are a source of 22 other rivers including Gambia and Senegal. The Guinea Highlands is covered by dense forest with main trees being ebony, mahogany and the teak with the lower land being savannah grassland. The area receives high rainfall making it wet all year round therefore making the Niger an all season river. The Guinea Highlands are at an average of 500 meters (1640 feet) above the sea level though there are some high peaks like the Bintumani Mountain in Sierra Leone which is at 6,381 feet (1,945 meters) in elevation. 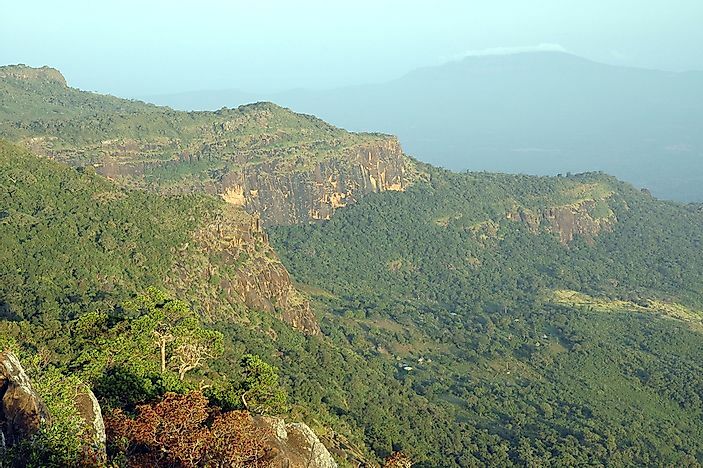 Other high points along the guinea highlands are the Nimba Mountains at 5,748 feet (1,752 meters) high and mount Sankan Biriwa at 6070 feet (1,850 feet) elevation. The river grows bigger downwards due to various tributaries such as the Sankarani, Bagoe, and Milo. The river is very significant to the extent of two countries namely Niger and Nigeria obtaining their name from the river. Various organizations have invested heavily in the river because of its significance to the people and animals. These organizations include the Niger Basin Authority, OPEC, Islamic Development Bank, and African Development Bank.